August 9, 2018. Department of Veterans Affairs Knoxville Outpatient Clinic’s Acting Supervisory Psychiatrist Dr. Robert Hierholzer receives the JL Award from Mountain Home VAMC Facility Director Dean Borsis on behalf of the Council and Vet to Vet Tennessee for his outstanding service and sacrifice as the Chief Mental Health Director at the clinic for over 1 year. 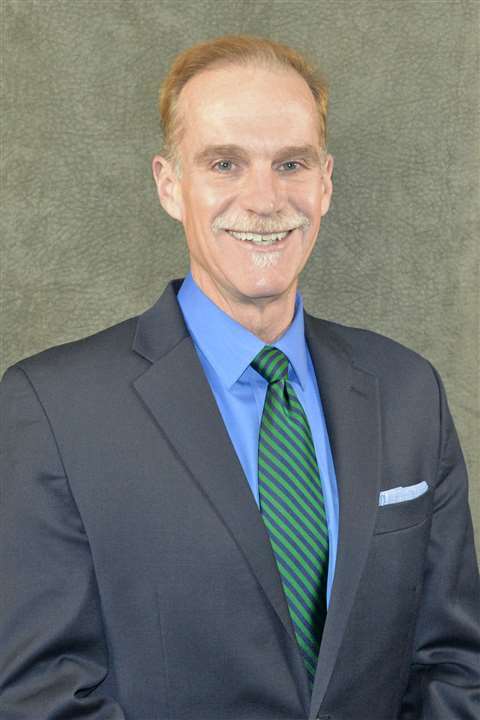 Dr. Hierholzer also served as the Council’s KOPC liaison. Upon receiving the award from Mr. Borsis, Dr Hierholzer sent us the following email: Dr. Hierholzer retires at the end of August 2018. May 28, 2018. 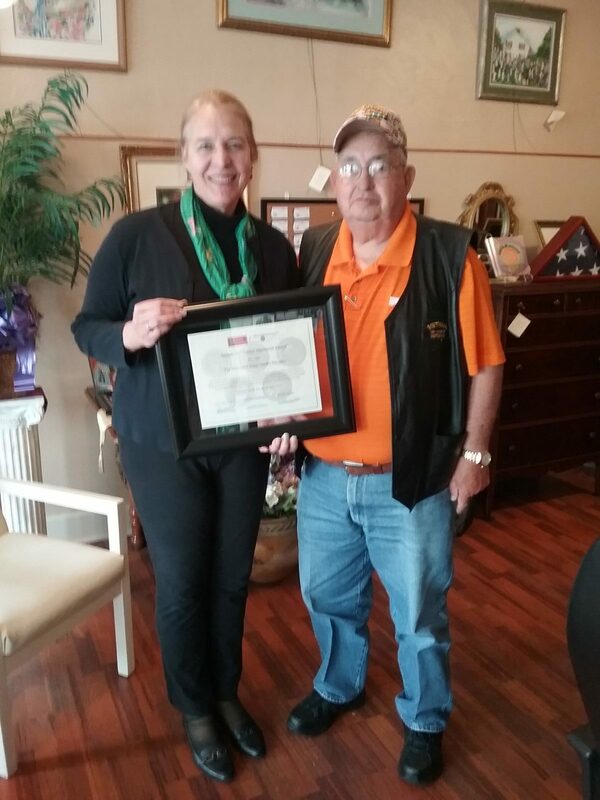 Monroe County Circuit Court Clerk Marty Cook receives the JL Award from Vet to Vet Tennessee Secretary Bob Hatley for her service and sacrifice in supporting the Monroe County Expungement clinic conducted on April 21, 2018. Marty and her six circuit court clerks worked for 5 days prior to the clinic and attended and served hundreds of citizens on Saturday. We appreciate your support. May 16, 2018. 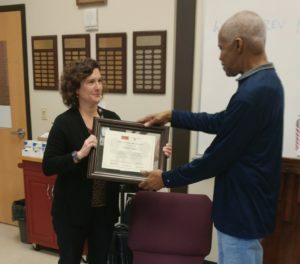 10th Judicial District Circuit Court Judge Sandra Donahey receives the JL Award from the 10th Judicial District Mentor Coordinator Bob Hatley for her dedication and service during the first 10th Judicial District Expungement Clinic held at the First Baptist Church of Madisonville on April 21, 2018. Judge Donahey is truly a visionary with new innovative program like the clinic. 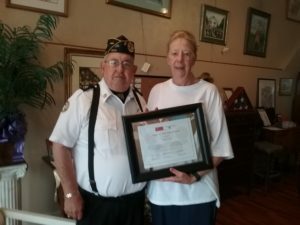 Judge Donahey is developing a Veterans Treatment Court in her district tentatively schedule to open in July 2018. March 8, 2018. Debra Cohan, the Department of Veterans Affairs Knoxville Outpatient Clinic’s Suicide Prevention Coordinator, attended the regularly scheduled Council meeting on Thursday March 8, 2018 to discuss the Council and Vet to Vet Tennessee’s new suicide prevention program. 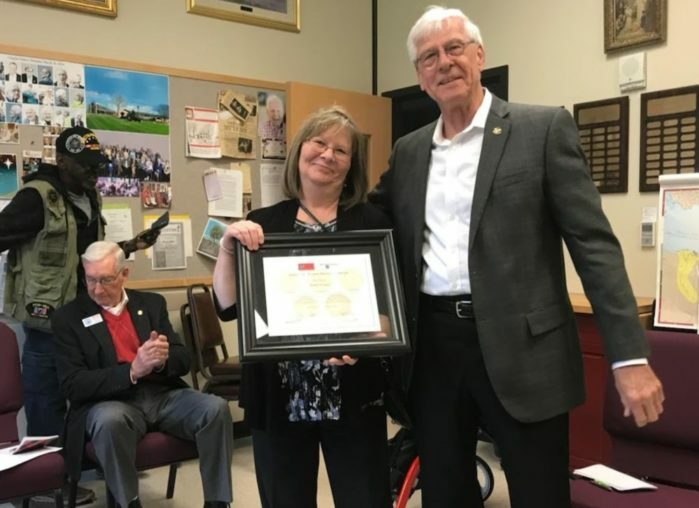 In recognition of Debbie’s service to veterans and their families helping them overcome adversity, the Council and VTVT bestowed to her the Jospeh “JL” Tucker Memorial Award. February 8, 2018. 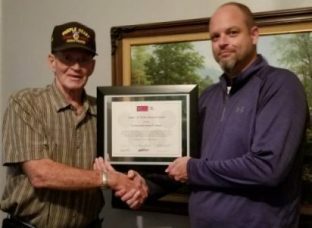 Mountain Home VAMC Facility Director Dean Borsis presents two Vet to Vet Tennessee awards to VA Knoxville Outpatient Patient Clinic (KOPC) Clinical Therapist Dr. Donald R. Richardson on behalf of the VTVT officers and members. 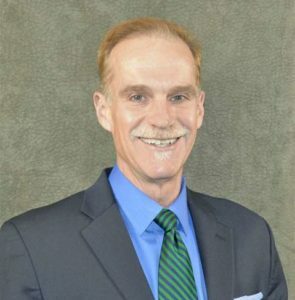 Dr. Richardson created and lead the first KOPC PTSD workshop in April 2011. 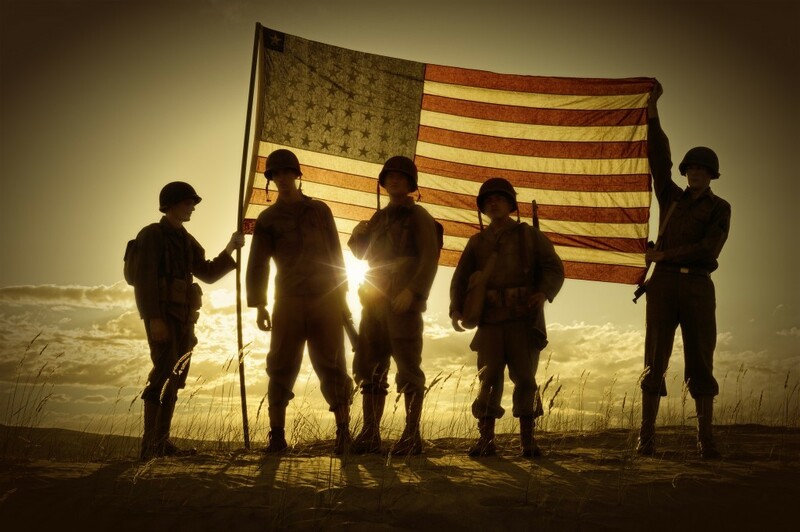 The original 23 veteran members of Dr. Richardson formed three organizations as a result of the work group: the Knoxville Regional Veterans Mental Health Council, Vet to Vet Tennessee and the Legacy Peer Support Group (LPG). LPG was named after the legacy of our first group member to die, George A. Thomas. 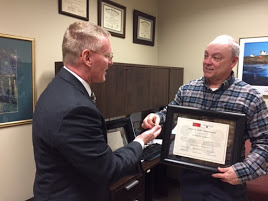 Dr. Richardson was also presented with the JL Tucker Memorial Award by Mr. Borsis. 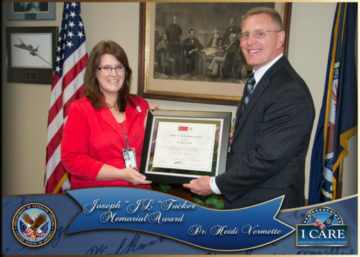 Doc was the first recipient to receive The George A. Thomas and The JL Tucker awards from the Council and VTVT. He not only changed the lives of George and JL but also the lives of almost all of the Council, VTVT and LPG members. He is special and we are blessed to still receive his services. 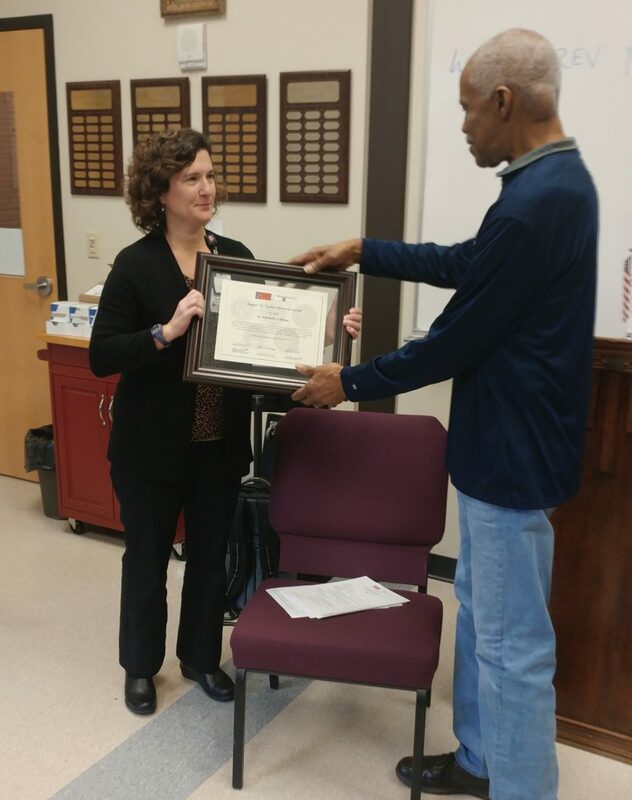 January 11, 2018, Award bestowed to Mountain Home VAMC , Associate Chief of Staff (ACOS) Primary Care Case Manager(PCCM) Dr. Elizabeth Bishop. Presented by President Freddie Owens. January 11, 2018. 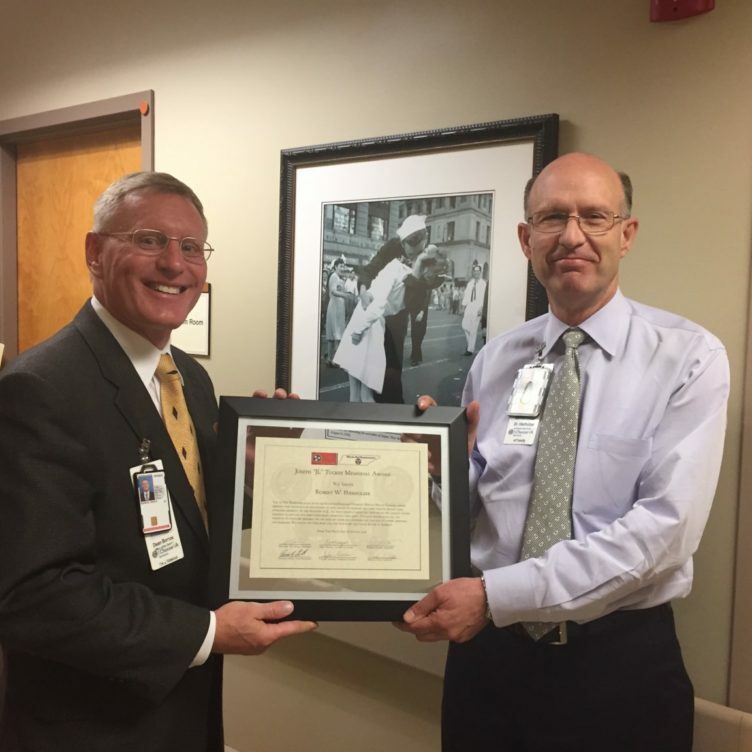 Award bestowed to Mountain Home VAMC Deputy Director Dan Snyder. Will be presented to Mr. Snyder by Dr. Elizabeth Bishop on behalf of the Council. October 18, 2017 Award bestowed to Mountain Home VAMC Associate Chief of Staff Mental Health and Council Liaison Dr. Heidi Vermette. presented by Mountain Home VAMC Facility Director Dean Borsis. 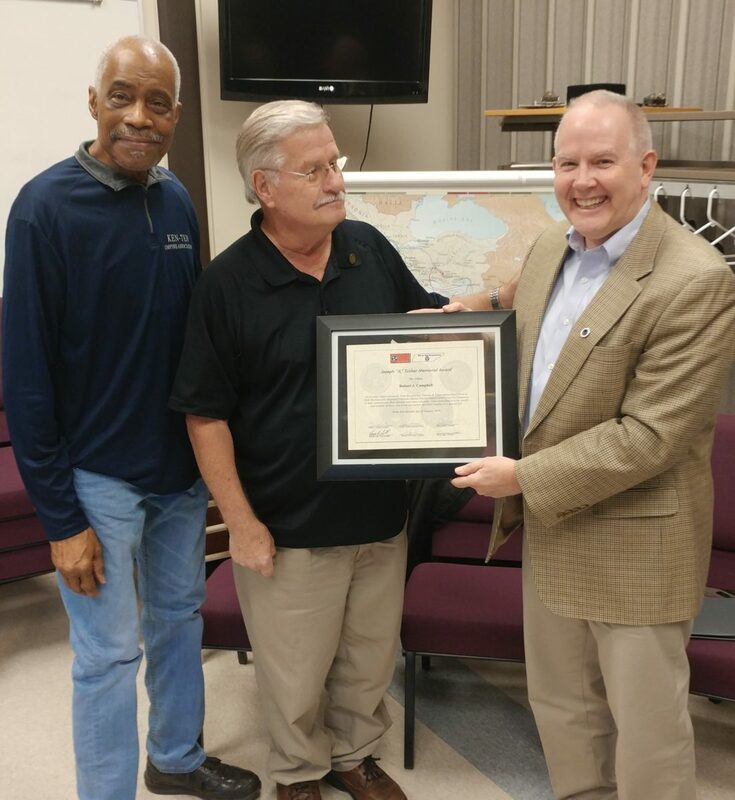 9-13-17 – Award bestowed to Honorable Monroe County General Sessions & Veteran Court Judge Duane B. Thomas. Presented by Outreach Officer Taylor Thomas, who is Judge Thomas’ father.